TDmonthly - Hollywood ToyBoy: Where Did the Year Go? Hollywood ToyBoy: Where Did the Year Go? Okayokayokay — from November 15th to January 5th, you can pretty much kiss off Hollywood. Oh, everyone says they’re going to get stuff done (and the grunts in the trenches actually do), but, really, it’s holiday time, and the biz grinds to a halt. Honest. So, what’s up? More video podcasts, cartoons on demand, etc. Frederator Studios (Fred Seibert) has launched Channel Frederator for handhelds, computers, iPods and PSPs. We’re talkin’ 10- to 15-minute episodes with original and “vintage” toons: stuff from Blur Studio, Wild Brain and Nick. Look to the Xmas season of kidult gear (kid cell phones, kid computers, etc.) to push demand for these icasts and vice versa. According to — count ‘em — 3 different execs at major studios, 2006 will be the year of downloadable viewing, and kids will lead the pack. Speaking of leading the pack: We know Lucasfilms is coming out with a digital TV series called “Clone Wars” (they’re doing it in Singapore) — Georgie is looking to 2007 to roll it out. What we didn’t know, until a woman high in the upper echelons in Lucas Land told us, was the push on licensing. There may not be another "Star Wars" movie, or so she says now, so look to this series to fill the gap as the myriad novels filled the gap in the past. 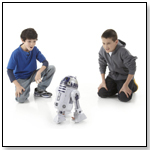 Merchandising from "Star Wars" is a herd of cash cows, so no one’s gonna stop that. The question is how to keep the brand in front of the buyers without another film (a little like when the Beatles stopped touring). There are some extreme 3D ideas in the works, total immersion, virtual stuff that will make today’s televisions and video gamers seem downright Stone Age. More is in store. On the other end of the spectrum, NASCAR Inc. and Reel FX Entertainment Group have teamed up for a brand of products targeted to preschoolers called NASCAR Jr. The brand will include an animated series (which sources say both Discovery and PBS are looking at) and tons of merchandise. The goal: NASCAR mania from birth to grave. Nickelodeon and Warner Brothers have awarded LEGO some global toy licenses. On the Nick side — SpongeBob and "Avatar: The Last Airbender." On the Warners side will be some Batman stuff that includes playsets, gadgets and mini-figures. The playsets will be the big push. 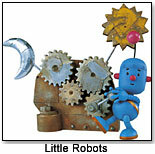 Look to Playmates Toys Inc. for more playsets, coming out in fall of 2006 with the Little Robots merchandise. “Little Robots” is a British series that will inch its way westward after the toys hit — or at least that’s what a VP at a UK studio was saying on the phone the other day. Robots are going to be big in 2006. And a company that’s always deep into the entertainment arena is Jakks Pacific Inc. They are licensing from DreamWorks Animation to do multiple Plug It In & Play TV Games ("Shrek," "Shark Tale," "Over the Hedge" and "Madagascar"). They are teaming with Nelvana Ltd. for interactive books based on "Babar" and "Max and Ruby." And they’ve gone in with Marvel Entertainment Enterprises, Inc. for more Plug It In & Play TV Games as well as … get this: dog and cat accessories. What will they think of next? And, near and dear to our hearts: the Xiaolin Showdown Trading Card Game by Wizards of the Coast. Based on the Warner Brothers animates series (which is getting picked up for another year), look to more and more "Xiaolin Showdown" merchandise to (much as the show did in 2005) slowly reach a critical mass in 2006. Warners execs never knew how good the show was, but now they’re scrambling to figure it out. Or maybe they just want to do more “Loonatics” … hee-hee-hee. Merry Chanukah, Happy Xmas, have a good Kwanzaa and we’ll do lunch in the New Year.